Under $1.50 per serving. 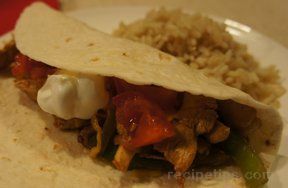 Your choice of seasoned steak or chicken served in warm tortillas with your favorite toppings. 1. Heat 1 tablespoon of the oil in large skillet on medium-high heat. Add meat; cook and stir 3 minutes or until no longer pink. Remove from skillet. 2. Heat remaining 1 tablespoon oil in same skillet. Add onion and bell pepper; cook and stir 3 to 5 minutes. Return meat to skillet. Stir in water and Seasoning Mix. Cook 3 minutes or until heated through. 3. Spoon meat mixture into warm tortillas. Serve with assorted toppings, if desired.Test Kitchen Tip: Try also with skirt steak or flank steak.